All jokes aside, Halloween presents a huge sales opportunity for B2C (and even some B2B) brands. In fact, Halloween is only second to Christmas as the most commercially successful holiday. And a recent survey found that Halloween spending is estimated to reach $8.4 billion dollars this year, the highest in survey history. Depending on your line of business, this presents an enormous opportunity for marketing departments to help generate a ton of cash over a short amount of time. However, the bar is incredibly high and competition is stiff, which means that consumers are looking for clever, creative and memorable marketing campaigns. The seven spooktacular campaigns below made their mark this year. This spooky marketing tactic has been all over the news in the past few days. A Burger King in New York draped their building with a giant ghost and scrolled the word “McDonald’s” on it. They also updated their marquee for the holiday to say “Boooooo. Just kidding, we still flame grill our burgers. Happy Halloween”. In just a few short days the video already has almost 500,000 views on YouTube. Each year, Chipotle runs a promotion offering discounted food to customers who show up in-store wearing a costume. I will admit that I have personally partook in this promotion more than I’d like to admit. Not only has this one Facebook post received over 7,000 reactions, but nearly 3,00 shares as well proving that followers (and their friends) are keen on the deal. The latest Airbnb contest is not for the faint of heart. The travel giant offered two “lucky” people the opportunity to spend Halloween night in the Paris Catacombs. In case you didn’t know, the Catacombs are the final resting place of 6 million souls. In order to win the full experience, followers were asked to share why they think they are brave enough to sleep in the Catacombs. I absolutely love this post from Petsmart. In addition to offering pet lovers a clever idea for carving pumpkins, they’re also encouraging user generated content by asking people to create their own and use the hashtag #WickedCute as well as tagging the brand and the “pet celebrity” that they choose. I was pretty impressed by this amazingly clever approach to showing how your energy consumption stacks up to the energy found in Halloween themed objects from Energy.org. Users can choose a number and energy type to find their output. Additionally, the organization also created a special Energy Ghostbusters podcast that shares “scarily effective” ways to save energy. This infographic from REI promises to supply you with the proper attire to survive a zombie apocalypse as well as “five critical skills to keep you from becoming a snack”. Not only is the release of this infographic timely for Halloween, but it also aligns with the premiere of the new season of the Walking Dead and will prove to be a piece of evergreen content for REI once the holiday has passed. The London Dungeon offers a truly unique theatre experience that features special effects, rides and the opportunity for patrons to hear, touch and smell the whole experience. Their latest campaign features the use of high-end Mac cosmetics to create an authentic (and truly disturbing) tutorial for turning yourself from fresh faced to wicked witch with some clever contouring. 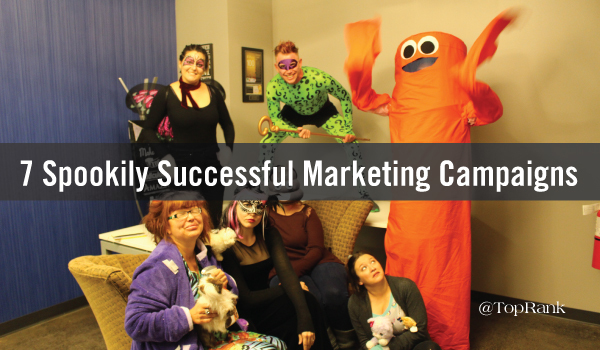 This post would be incomplete without including halloween insights from some of our TopRank Marketing team members. Below you’ll find a glimpse into halloween of years past as our team reflects on their fondest childhood halloween memories. When I was in first grade I was at the school Halloween party. And for three tickets you could place someone in jail for like 10 minutes. And my brother put me in. It had bars and I cried after 30 seconds so he changed places with me and served my time. It was traumatizing at the time. When I was 6, I dressed up as my favorite disney Character, Nala from the Lion King. I walked around all day saying “get your paws off me” because it was my favorite line from the movie. Every Halloween night my grandpa would come over for dinner. My mom always made baked spaghetti from a family recipe. After dinner my dad and grandpa would hit the streets with my sister and I, as well as the neighborhood kids, for trick or treating. When I was a kid, I remember trying to find the “best” houses which of course were the ones with the full-sized candy bars. Throughout the night while we were trick or treating, my neighborhood friends and I would have silly string wars. Things got pretty messy. I remember the thrill of running around in the dark causing mayhem. And, there was nothing better than coming home with a full sack of candy! Tell us what you think! Which marketing campaigns did you find extra spooky and impactful this year?